Air layering propagates plants by stimulating new root development on the upper portion of the plant such as the trunk or branch. 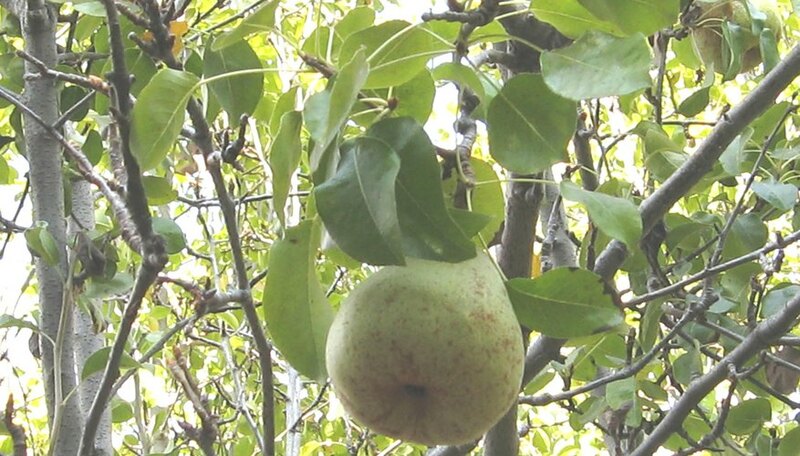 Using this method of propagation from a single tree helps farmers and orchard owners grow multiple plants from a particular species a fruit-bearing tree such as a pear tree. There are different methods of air layering; however, not all methods will work for all trees. Choose the ring bark or the tourniquet method to air layer a pear tree. Choose an aerial portion (trunk or branch) of the pear tree, preferably below the fork, which is where an existing branch is located. Measure the diameter of the trunk or branch where you will make your ring bark. Sterilize the blade using cotton pads dipped in rubbing alcohol. Sterilizing can prevent infection or diseases coming from other plants where the blade was last used. Create a full ring bark. Scrape off the cambium layer back to the bare wood. The cambium layer is a thin-walled, colorless layer between the inner bark and the sapwood where new growth will take place. The length of the full ring bark should be the same as twice the diameter of the branch or trunk. Create a staggered ring variant by cutting two half-rings. Stagger the two with space in between measuring half the width of the diameter of the branch or trunk. Brush on rooting hormone to the cambium layer. Apply moist moss and wrap with plastic to encourage root development. Wait 4-6 months for new roots to grow. Select a healthy branch of the pear tree. A healthy branch should be free of diseases and infestation. Loop a copper wire around and below the junction of a branch. Twist and tighten the wire with pliers until it cuts into the bark. Allow the wire to cut about halfway into the bark. Use a wire thick enough to cut-through the branch or trunk. The thicker the branch or trunk thicker the wire should be. Apply moist moss and cover it with plastic. Wait 1-2 years for new roots to grow. Because this method is slower than the ring bark method, the plastic wrap may loosen due to harsh weather conditions. Inspect the plastic wrap for any damage every 6 months. Cover the plastic wrap with new ones as needed. Early summer is the best time to commence air layering for pear tree. The tourniquet method is slower, but safer, than the ring bark method.